Do you need a new clothesline? Do you know where to buy one? And most importantly, do you know how to choose the right one? The last question can cause a hiccup because there are so many options available; most people often feel unsure which brand to choose. To help you out, we have helped you prepare this short how-to guide on how to choose a clothesline for your backyard. However, if you have a smaller area to store your clothesline, then you have one of a few options. You can go with a portable clothesline, which is suitable for limited spaces. The traditional hills hoist is not always an option with a limited backyard space. If you have it in mind before, you can cross it out now. 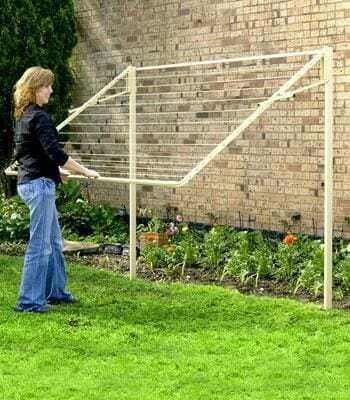 If you are only blessed with a sideway or a courtyard, a folding frame clothesline might be your choice. It is modern and can be a convenient choice for you. You can always fold it back and place it against the fence. It comes in various sizes too, so you can rub your taste buds with varieties available. If you have a small narrow area or angle, retractable models can work wonders for you. They are suited for this kind of area – although you need two walls at both ends to attach one. Now that you have a better idea about potential suitors, you can go ahead and choose one. But before that, you need to consider the impact of sun and air distribution in your backyard – this is very important. Most people think that it is the sunlight that dries out our clothing. If you follow that train of thought, you need to regress. The spoiler is that the breeze, and not the sun, that does most of the drying. Therefore, you need to consider whether you want your clothing to be under the full sun or half shade or just plain breeze. Most likely, you may not have any control over this, but it is worth mentioning. Do you have a large family? Do you wash frequently? 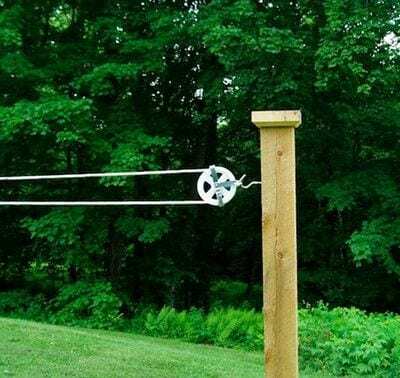 If you answer yes to the two questions, getting a rotary clothesline is the option for you. Often a large family necessitates ample lien space. And since rotary models often come in 60 metres in length, they tend to be more fitting for the family of four or more. However, if you don't want something that takes up too much space, you can go for retracting and folding models, both sometimes going as far as 40 metres in length. Recently, there has been lots of media output about dryers. Should you use them or not? And if you want an alternative, what should it be? The argument seems to be shifting towards abandoning dryers because they are evil. Well, the truth is that dryers are getting more and more expensive with an upward trend like that of a bird rising to the sky. Now this upward trend in cost is not the only factor that has reincarnated the negative feedback from the press. Dryers are considered to be environmental damaging and may only be useful during the winter months. It is also true that you can save £200 a year and cut down on your carbon pollution when you switch to the use of clotheslines. They are a better alternative because they are less expensive and can be used all year round. They also have low maintenance costs. What To Do when The Winter Months Arrive? There are many covers for folding frame clotheslines that you can use to keep your clothes dry when it is raining. Moreover, portable models can be used under your patio or garage, keeping your clothes safe from the beating of the raindrops. There are many ways to install a clothesline. Some can be mounted unto a brick wall while others can only be mounted to a post in the ground. You can use masonry walls to also install a clothesline with the help of all the accessories that comes with it. Before buying a clothesline, you should try to read the documentation on the brand and determine, first hand, if the installation is well suitable to the space you have back at home.